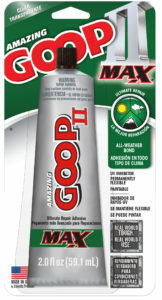 Amazing GOOP II MAX is the ultimate repair glue! It’s toughness is unlike anything else because it remains flexible while permanently bonding virtually any material and withstanding harsh environmental elements. REAL WORLD TOUGH. REAL WORLD USE.